Advances in public management sciences have long indicated the empirical finding that the normal state of public management systems is complex and that its dynamics are non-linear. Complex systems are subject to system pressures, system shocks, chance events, path-dependency and self-organisation. Arguing that complexity is an ever-present characteristic of our developed societies and governance systems that should be accepted, understood and adopted into management strategies, the original essays collected in this book aim to increase our understanding of complex governance processes and to propose new strategies for how public managers can deal with complexity in order to achieve high-quality research. The authors collected here use theoretical frameworks grounded in empirical research to analyze and explain how non-linear dynamics, self-organisation of many agents and the co-evolution of processes combine to generate the evolution of governance processes, especially for public urban and metropolitan investments. 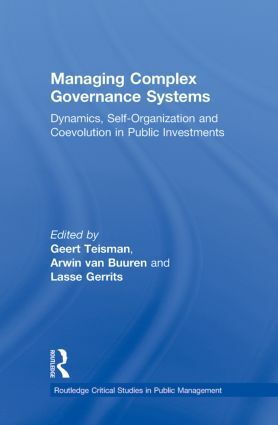 Managing Complex Governance Systems: Dynamics, Self-Organization and Coevolution in Public Investments offers readers an increased understanding of the main objective of public management in complexity--namely complex process system--and a strategy for accepting and dealing with complexity based on the idea of dual thinking and dual action strategies satisfying the desires of controlling processes and the need to adjust to changes simultaneously. List of Figures. List of Tables. List of Maps. Preface. 1. An Introduction to Understanding and Managing Complex Process Systems. Geert R. Teisman, Lasse Gerrits, Arwin Van Buuren. 2. Complexity Theory and Public Administration: A Critical Appraisal. Erik-Hans Klijn, Ig Snellen. 3. Approaches to Researching Complexity in Public Management. Jean-Marie Buijs, Jasper Eshuis, David Byrne. 4. Appearances and Sources of Process Dynamics; the Case of Infrastructure Development in the UK and the Netherlands. Geert R. Teisman, Eddy Westerveld, Marcel Hertogh. 5. Non-Linear Dynamics in Port Systems: Change Events at Work. Marcel Van Gils, Lasse Gerrits, Geert R. Teisman. 6. Metropolitan Regions as Self-Organizing Systems. Jean-Marie Buijs, Nancy Van Der Bol, Geert R. Teisman, David Byrne. 7. The Complexity of Self-Organization: Boundary Judgments in Traffic Management. Bonno Pel. 8. Coevolution: A Constant in Non-Linearity. Lasse Gerrits, Peter Marks, Arwin Van Buuren. 9. Public Policy-Making and the Management of Coevolution. Arwin Van Buuren, Lasse Gerrits, Peter Marks. 10. Managing Complex Process Systems: Surviving at the Edge of Chaos. Jurian Edelenbos, Erik-Hans Klijn, Michiel Kort. 11. Dealing with Complexity through Trust and Control. Jurian Edelenbos, Jasper Eshuis. 12. Complexity Theory and Evolutionary Public Administration: A Sceptical Afterword. Christopher Pollitt. 13. Towards an Approach of Evolutionary Public Management. Frank Boons, Arwin Van Buuren, Lasse Gerrits, Geert R. Teisman. Contributors. Notes. Index. Prof. dr. ing. G. R. Teisman is professor in Public Management at the Erasmus University Rotterdam. He received degrees in transport and sociology. His PhD thesis on complex decision making was first published in 1992, followed by a second and third edition in 1995 and 1998. On a regular basis he advises governments and private organizations on the management of complex decision-making, strategic planning, public-private partnerships, process management, intergovernmental co-operation in metropolitan areas and policy evaluation. Dr. Arwin van Buuren (1980) is assistant professor at the Department of Public Administration of the Erasmus University Rotterdam. His research concerns complex decision-making and knowledge management in the field of water management, spatial development, and infrastructure. He published in international journals like Public Management Review, International Review of Administrative Sciences, Evaluation Review, Science and Public Policy. He is a member of the Scientific Council of the Dutch Advisory council for research on spatial planning, nature and the environment. Dr. Lasse Gerrits, was a researcher at TNO Built Environment and Geosciences and a Ph.D. student at the Department of Public Administration (Erasmus University Rotterdam) between 2003 and 2008. He received the degree of Doctor in 2008 for his research on complexity theory and decision making. He now works as an Assistant Professor in Public Administration and works in the field of decision making and spatial development.